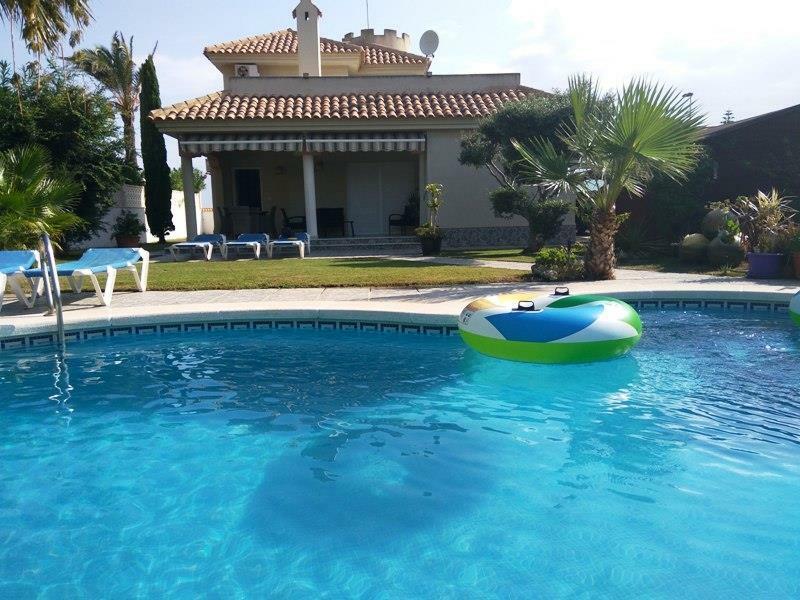 3 Bedroom 3 Bathroom Villa with swimming pool set in its own gardens, 2 mins walk to the beaches, Mar Menor & Mediterranean,50 inch Smart Plasma TV, Free Wi-Fi, Internet available. Great location, lagoon is great for families with children. Great weather. Need a car for the shops. Villa had "good hygiene practices" notices on the walls but did not provide you with any cleaning materials. Pool was dirty on arrival & we were expected to maintain it for two weeks ourselves but again with no chlorine just basic brush & net. Air conditioning limited allowance for the two weeks, only used it at night but was not enough to supply the 3 bedrooms. Perfect relaxing getaway for a lazy family holiday. House very up to spec, garden area and pool beautiful and well equipped . Area has plenty of cafes, shops and a fantastic restaurant 5mins walk away, escuela de Pieter. I would recommend a car. Whilst not essential, this house is right at the end of the strip and moving about on the strip was very much easier having a car. It also enables you to get out and about to watermark, Cartagena, la manga club ..things that would have been difficult without one. We would certainly recommend . Weather perfect and wonderful heat tempered by by the fantastic breeze permanently coming in off the Med.